Registration is now open for the AHCA/NCAL 70th Convention & Expo in Orlando, Florida, October 13-16. Convention features two exciting keynote speakers that are not to be missed. The Opening Keynote is Doris Kearns Goodwin, world-renowned presidential historian and Pulitzer Prize-winning author. During her address, Goodwin will reflect on more than 150 years of U.S. history and put into context the current fast-paced, unpredictable, and, at times, impulsive administration. By sharing her deep understanding of the ambition, resolution, and resilience of some of our nation’s most revered presidents, she will explain how past setbacks and triumphs shed light on the cultural, economic, and political transformations that define today’s turbulent times. Goodwin brings to life some of our most successful presidents, providing insight on today’s leaders and demonstrating that however fractured our modern political culture has become, our democracy is also resilient and has survived, and even thrived, through more troubling times in the past. 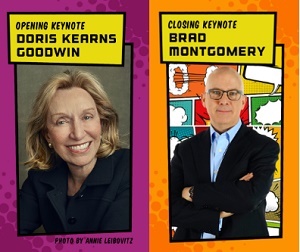 Brad Montgomery, this year’s Closing Keynote, is a well-known motivational speaker who uses humor, interactivity, sound, music, and visuals to ignite audiences so that they can use happiness as a tool to improve their lives and their jobs. He has spoken all over the world and was recently inducted into the CPAE Speakers Hall of Fame. He turns typical meetings into transformational events using the power of happiness. To learn more about all Convention & Expo keynote speakers, education sessions, events, and sponsors, visit our official convention website. The early bird deadline is July 26. All attendees must be registered for the event before hotel reservations can be made. You may do both when registering online.